I love this adorable kitty too cute and ready for the pumpkin patch!! I used some of the files from the Pumpkin Patch Cuties set and added a circle for the moon tried to color it like Sandy Allnook, lol! Diecut sign and sentiment are from Jaded Blossom's Harvest Signs and Fall Dies sets. So adorable! Perfect for Halloween! So darn cute! Love Fall inspired things! All the details in this are awesome. Great job! Love the scene you created -- so cute!! She is just adorable, thank you! This hop is just getting cuter and cuter! Absolutely love it! I think I need to mass copy this cards for friends and family this October! So fun and festive, love it! Aww your pumpkin patch kitty is so cute! I love all your details!!! Super cute, purrfect for Halloween. Great project. Another cutie -great for Halloween! How cute! Just in time for Halloween! Love your Pumpkin Hello Kitty. She is adorable. Thank you for sharing. Have a great crafty day! Sensational - my fav so far! Holy macaroni! This is just the bee's knees! Instead of a Charlie Brown Halloween theme, it's a Hello Kitty theme! I love how this turned out and your moon is awesome! Would love to know how you shaded/colored it in! This Kitty almost makes me want summer to end so that pumpkin time arrives. OMG!! Your AWESOME project makes me ready for fall!! WOW!! Now THAT"S adorable. Is she waiting for the Great Pumpkin? You did a great job on the moon! Sandy would be proud. what a great, fun card. This is adorable!! Hello Kitty Halloween is the best!! Cutest little HK pumpkin I have ever seen - love all the dimension in your project. Gosh, I love everything about this card! very cute..I was hoping that I would see this one. Great card! Love the pumpkins! I adore this. Just perfect. loving the pumpkin add on! Love to see a call card!!! Great colors! This is SO super cute! Love that scene you created! Love this project. She is so cute as a pumpkin. Thanks for your time and talent. very cute! I love all things halloween!!! Cute, cute, cute! Great Halloween card! that is one pumpkin patch i'd love to visit! So much detail here - Love it. Love the background shy and grass. How did you do this? Your attention to detail is great. The moon looks wonderful! Great card!! Perfect for fall and Halloween. very cute pumpkin kitty! lots of detail work. Adorable! Great details and pictures. Super job! LOVE LOVE LOVE this Brigit!!!!! This is awesome, love the detail on the moon! So stinkin cute!! Love this!! Your pumpkin HK is adorable! What a sweet costume on Hello Kitty, love your scene. That is really a cute card! I just love it! One of the most addable pumping patch cards I've ever seen. Love, love, love this cute Pumpkin Kitty. Oh this is precious! Love it! 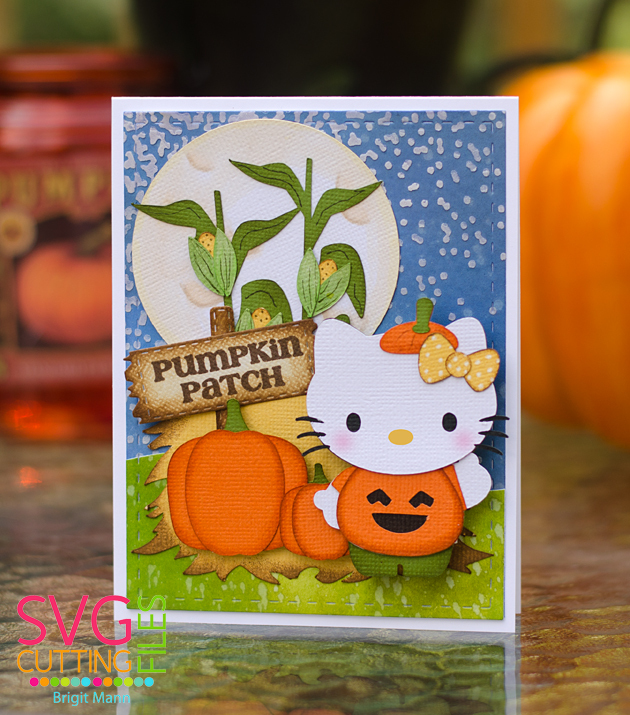 Love your card with the pumpkin Hello Kitty and the corn stalks. Fantastic job! Love the kitty with pumpkins!! Cute!! I love your background texture. Gives the card a nice layer of dimension. Cute kitty. Fall is my favorite season so your project really stands out to me! Cute! Love it! Aaaw, super sweet card! Your kitty/pumpkin is adorable!! Super cute as always Brigit! And another card I love. I love everything about this card. Great work! Your card is so adorable! Love it!! Such a sweet card. Love it. Following you!!! Love all the goodness!!! I really need to do this one, I just love it. Love HK all dressed up for Halloween! Cute pumpkin! So adorable and cute! Too cute to spook! I love this card and the blue sky paper is amazing it looks 3D! Cute scene! Hello Kitty makes a darling pumpkin. I don't celebrate Halloween, but she has a wonderful fall look that is just perfect! Love the card! it looks so cute. cutest pumpkin patch! love it!!! Oh M Gee LOVE it!